Hip In Detroit: More Tickets?! Win Tickets To See Trash Brats at Small's Anniversary Party With Troubleman & Break Anchor! More Tickets?! 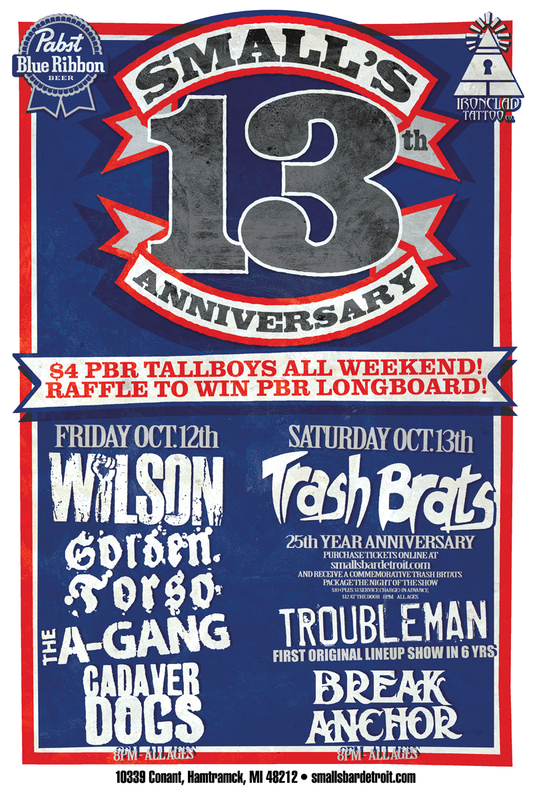 Win Tickets To See Trash Brats at Small's Anniversary Party With Troubleman & Break Anchor! Lately I have been reminiscing a lot about shows, bands and events that have come and gone. Some nights everything just comes together and it creates a lasting memory that sticks with you for life. For instance, I will never forget when glitter fell from the ceiling of The Fillmore as Hole played Northern Star, not only was it my favorite song at the time, but I was dancing 5 feet away from Courtney Love. I can close my eyes and listen to that song and instantly be beamed back to that moment. On October 13th, Small's will be celebrating 13 years of being open. The Trash Brats will be celebrating 25 years as a Detroit punk rock staple, Troubleman will be playing their first show with the original lineup in 6 years, and Break Anchor will continue to take over this town one show at a time. Those in attendance for the show will likely make another memory of a great night at Small’s to recount to their friends. Want to go to the show? Well, here’s your chance to win a pair of tickets to see the Trash Brats, Break Anchor and Troubleman for free. All you have to do is log into Facebook or Twitter and tell us your best memory from a Break Anchor, Trash Brats or Troubleman show. Or, you can just tell us what your favorite memory of Smalls is. Just post on our Facebook or Twitter and we will pick one lucky winner Friday, October 12 to be on the guest list for the party! Tickets for the show are available at smallsbardetroit.com. The show starts at 8 p.m. and $4 PBR tall boys will be on special all night. All tickets that are purchased in advance will entitle the purchaser to a 25th anniversary CD from the Trash Brats on the night of the show. So, if you do not win your tickets on Friday, make sure that you log online and get them before doors.